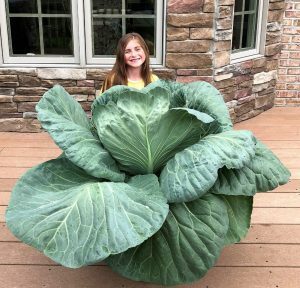 A Western Pennsylvania elementary student earned some cabbage for growing a giant (and we mean giant) cabbage. Lily Ries participated in the National Bonnie Plants Third Grade Cabbage Program and was randomly drawn as Pennsylvania’s winner. Lily, now a fourth grader at Peebles Elementary in North Allegheny, earned a $1,000 savings bond in the drawing conducted by Pennsylvania’s Agriculture Department. More than 31,000 students in Pennsylvania participated in the program, which gives more than one million third graders a chance to get gardening experience. Bonnie Plants delivers ‘O.S. Cross’ cabbage plants, which can grow up to 50-pound heads, to schools that have signed up for the program. The plants start only a few inches high, so it’s up to the students to nurture them. Each school chooses its “best” cabbage that gets entered in the state-wide competition. Teachers interested in running the program at their school can find more details here.